I pack lunch most days, so I try to keep things interesting and mix it up. Usually it ends up being a salad (different ingredients every day)…reliable, but boring. Dan suggested I try pasta salad, so I cobbled one together for lunch today and it was such a nice change. Cook a random amount of pasta until al dente, then measure out desired amount (I used 3/4 cup cooked pasta) and rinse under cool water. (NOTE: don’t ever do this for pasta you’re mixing with a sauce & serving hot! Rinsing totally ruins it). Leftover pasta can just be put away — or you can make it all at once. Steam or saute shrimp (I let mine thaw in a colander and then dropped them in the pasta water toward the last minute or so of cooking). Cut into small pieces. In a bowl, combine cooked pasta, cut shrimp and all veggies. I made my veggies fairly small — not minced, but diced or a bit larger. Add dressing and mix well, then add a large drizzle of EVOO, along with garlic salt, white pepper & black pepper. Other spices might be good too — garlic powder, cayenne, anything really. After the entire thing is mixed together, you can grate some hard cheese over it. I grated Pecorino Romano from a block, but I think parmesan would work as well. I’d recommend grating it fresh if you can instead of getting it pre-grated…tastes better! 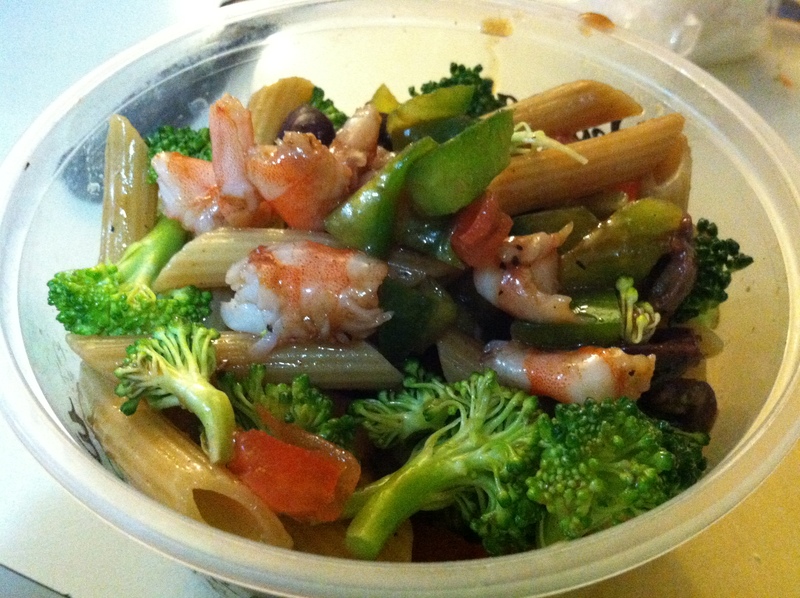 Posted on April 19, 2012 April 19, 2012 by Olivia FecteauPosted in foodTagged lunch, pasta, salad, shrimp, vegetables. That looks great and healthy! Thanks! I think it was a good combo of healthy and tasty!